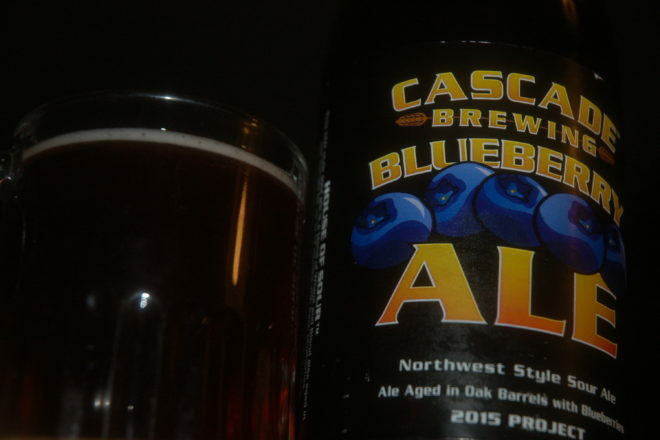 The lyrics to “Blueberry Hill” played in my head as I unlocked a bomber bottle of Cascade Brewing’s Blueberry Ale. The song will forever be associated with Chubby Checker and his 1956 rendition of the song, but it was actually written in 1940 and recorded by six different artists that year, including versions by Gene Krupa, Gene Autry, Jimmy Dorsey and the Glenn Miller Orchestra, which had a No. 1 hit with it. Nine years later in 1949 Louis Armstrong brought it back into the charts. But it is Antoine “Fats” Domino’s 1956 version that placed the song in rock history. Rolling Stone magazine named it Number 82 in its list of the 500 greatest rock and roll songs. However, my mind can’t help making associations. Crack open a blueberry sour ale and the poignant lyrics of “Blueberry Hill” come pouring out with the faintly purple-tinged beer, reminding me of lost loves and the many turns life takes. There’s a faint hint of blueberry in the nose, and a definite taste of blueberry wrapped into the sour punch. The base ale, according to the label, is a mix of wheat and blond ales. I’ve been in a decidedly sour mood lately, so I have no problem puckering up to this tasty 8.23-percent beer. Eight point two three? I cannot think of another brewery that measures with such precision. However, as a longtime fan of wild blueberries – the best you will ever taste grow along the rocky cliffs of Lake Superior north of my hometown in Duluth – I was really hoping for a more prominent blueberry taste. The blueberry taste here is buried by the sourness, but sours tend to hijack flavor profiles. The magic fridge is holding Cascade’s Apricot Ale for a future tasting, and I’m kicking myself for not picking up their Figgy sour.